This rustic Karoo-style Apricot Tart shows how good perfectly ripened apricots can taste. Fresh apricots are such a treat so when we use them in our baking we want a dessert that brings out their sweet and acidic flavor. I believe this tart does just that. It takes fresh apricots, with their skins still intact, cuts them into thick wedges, gently tosses them with sugar and a little salt, and arranges them on a platform of buttery crisp pastry. 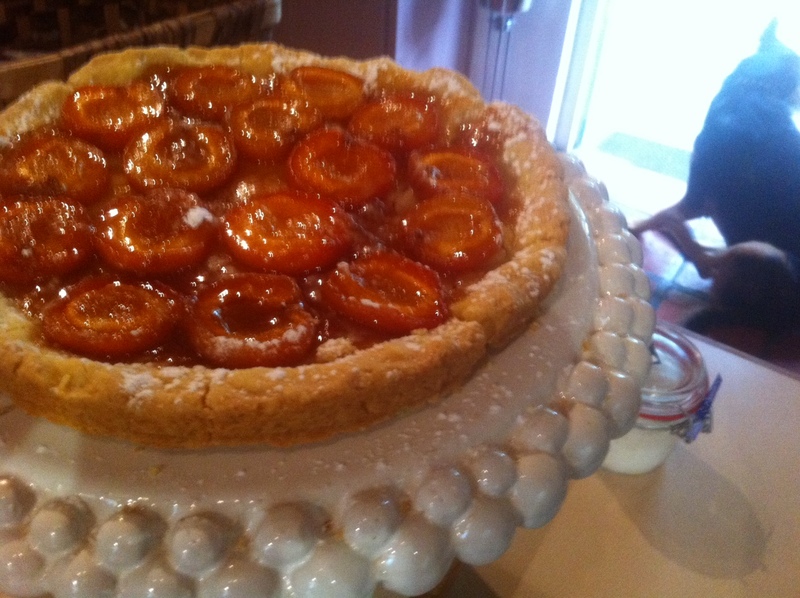 I love how this tart looks after it is baked, the golden brown pastry and the apricot wedges with their caramelized tips. Very nice warm from the oven served with a small scoop of vanilla ice cream. Short Crust Pastry. In your Magimix, place the flour, salt, and sugar and process until combined. Add the butter and process until the mixture resembles coarse meal (about 15 seconds). Pour 1/8 cup (30 ml) water in a slow, steady stream through the feed tube until the pastry just holds together when pinched. Add remaining water, if necessary. Do not process more than about 30 seconds. Turn the pastry out onto your work surface, gather it into a ball,cover with plastic wrap, and refrigerate for about one hour tochill the butter and allow the gluten in the flour to relax. Once the pastry has chilled, remove from refrigerator and place on a lightly floured surface. Roll the pastry into a 13 inch (32 cm) square.To prevent the pastry from sticking to the counter and to ensure uniform thickness, keep lifting up and turning the pastry a quarter turn as you roll (always roll from the center of the pastry outwards to get uniform thickness). Transfer the pastry to a parchment paper lined baking sheet. Cover and place in the refrigerator while you prepare the apricots. Apricot Filling: Wash the apricots. Cut the apricots following the suture from stem to blossom end and then up the opposite side. Gently twist the two halves of the apricot and it should easily separate. Remove the seed and cut each half into two or three wedges (depending on size). Place the wedges of apricots in a large bowl and season with a pinch of salt. Then add the granulated white sugar and toss gently to combine. Arrange the apricot wedges evenly on the pastry (cut side up), leaving about a two inch (5 cm) wide border. Scrape any remaining sugar from the bowl and sprinkle over the apricots. Gently fold the edges of the pastry up and over the apricots, pleating as necessary. Make sure to seal any cracks in the pastry. Bake the tart in a preheated 200 degree C oven for about 35 -45 minutes or until the pastry is golden brown. Remove from oven and place on a wire rack to cool. Garnish with chopped pistachios or almonds. Best served warm, with vanilla ice cream. Makes one – 26 cm tart. The picture was taken over the Christmas weekend with the tart posing nicely on my new Mud cake stand from the Swellendam RAIN shop. DO yourself a favour. Check out the shop. It is amazing. I covet the entire range of Mud products. Mud ceramic studio is the brainchild of South African couple Werner and Phillipa du Toit. Working closely with underprivileged communities to uplift employment, the chandeliers are hand made with beads unto a wire frame to create various forms. The hand crafted beads represent simplicity in design and diversity in materials to create other forms. The chandeliers are successful they are bringing employment to the local regions in the Orange free state and garnering much international acclaim. Due to higher demand, the pressure to mass produce is on the rise but mud is devoted to continually making hand made products.